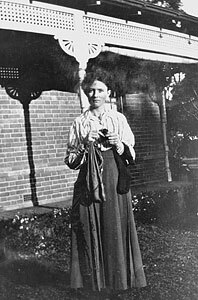 I would like to introduce you to Charlotte "Diddy" Cossington, knitting socks for “our boys in the trenches” during the Great War. 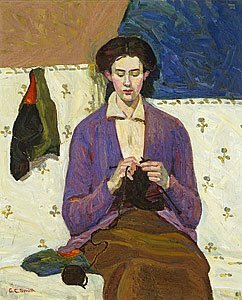 She is the sister of that wonderful Australian Artist, Grace Cossington Smith (1892-1984) and the subject of her wonderful painting “The Sock Knitter”. I first saw this painting at the Art Gallery Of New South Wales in 1978 and I was captivated by it. I didn’t knit then so it wasn’t the subject that so entranced me – it was the form and the colour. The image does not do the painting justice – the purple sweater she is wearing is a rich layering of blue, brown and purple brush strokes with a touch of green that is matched by the bag that hangs beside her. The gallery description speaks of her modernist influence, her groundbreaking style and how she was acclaimed as the first post-impressionist painting to be exhibited in Australia, but was she ever feted for this talent? No, she was a woman, and to make it worse an unmarried woman living a spinster lifestyle with her parents in the northern suburbs of Sydney. It is only now, I hope, that she is receiving the recognition she so richly deserves. I salute you, Grace Cossington Smith. So grateful that this amazing woman's work has been preserved. So timely in our generation as well. Thanks for posting this beautiful painting and the history.